This month we hit a dubious milestone: It's the fifth anniversary of domestic airlines deciding to charge fees for checked baggage. The very first checked baggage fee actually showed up in May 2008, points out FareCompare.com. That was when American Airlines, responding to rising oil prices, decided to stick its neck out and take the risk of being the first major airline to implement the fees. A couple months later, in July, the other airlines decided to follow suit, and that's the anniversary we're "celebrating" this month. While griping about airline fees is a popular pastime among travelers, FareCompare CEO Rick Seaney says they were born out of desperation, not greed. "Fees in general saved the airlines, to be honest," he says. "If you asked an airline executive [in 2008] if he could survive long-term at $100-dollar-a-barrel oil, he would have laughed. He would have expected that he couldn't raise ticket prices high enough to recoup [costs]." %VIRTUAL-pullquote-The mantra from the consumer is, 'Just put it in the price of the ticket.' And as soon as airlines do that, they quit buying tickets.%Instead, the airlines kept a lid on advertised fares but tacked on baggage fees, which proved to be a lucrative revenue stream, to say the least: U.S. airlines made $3.4 billion in checked bag fees in 2011 alone, a figure that doesn't include revenue from various other fees now being charged to travelers for everything from earlier boarding to the extra legroom of an exit row seat. Making money through fees allowed the airlines to stay solvent without driving off customers. "The mantra from the consumer is, 'Just put it in the price of the ticket,'" says Seaney. "And as soon as airlines do that, they quit buying tickets." That's not to say that we should actually be celebrating baggage fees. While Seaney notes that ticket prices have grown at a relatively slow rate over the last five years, they haven't exactly gone down, either. So it's not as if breaking out fees into a separate charge has appreciably lowered the price of travel for those who know how to pack light. And in a lot of ways, baggage fees have made flying a less pleasant experience. Travelers who want to avoid a $50 round-trip fee are forced to stuff everything into a small carry-on. If they still have too much stuff, they're forced into a cat-and-mouse game of trying to get all their stuff past the gate agent, creating an adversarial relationship with the company. (It's no wonder airlines consistently rank as one of the worst industries for customer satisfaction.) And all those fliers trying to cram carry-on bags into overhead compartments creates havoc on crowded planes, a problem that American Airlines is now trying to solve. We can grumble all we want, though: Baggage fees have proven a smashing success for the industry, so don't expect them to go anywhere. And Seaney echoed our prediction from a couple months ago that Southwest Airlines (LUV), one of the last holdouts against the fees, was gearing up to reverse its policy. 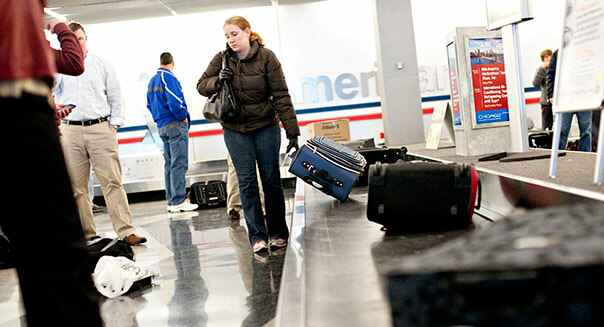 In just five short years, baggage fees have become the industry standard. And in another five, it will be hard to remember there was ever a time when you could check your luggage for free.